During the Russian probe hearings on Monday, former acting DOJ Attorney General Sally Yates batted off Trump-supporting Republicans like flies during their attempts to discredit, shame and trick her. They failed, and once again, the GOP embarrassed the country in efforts to defend Donald Trump. 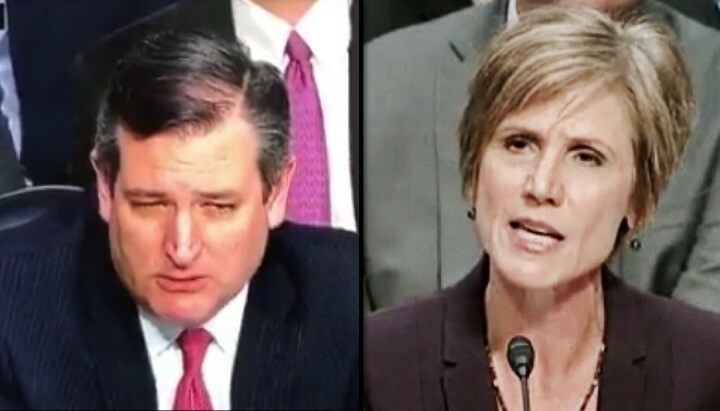 During one particular pompous and unrelated inquisition, Texas Senator Ted Cruz pompously decides to question Yates on the Trump’s Muslim ban rather than Mike Flynn or the Trump-Russia investigation — the reasons for the hearing. Cruz found himself messing with the wrong person, as he tried to edify Yates on Trump’s authority using a section of the INA/Immigration and Nationality Act. Here is the transcript of the exchange. Ted Cruz: Earlier when Chairman Graham asked you that, I thought you declined to answer so perhaps I misunderstood that. ​​Sally Yates: And I may have misunderstood the question. I thought the question I declined to answer was a different one than that, so I’m glad I got a chance to clear it up. Ted Cruz: Okay, so you have no information of any interceptions of the Bernie Sanders campaign, the Hillary Clinton campaign or other candidates in the 2016 campaigns. Cruz then goes off the hearing’s topic to Trump’s Muslim ban. This is where his true snide and smug self was revealed for all to see. Ted Cruz: Okay. Let’s revisit the topic, Miss Yates, that you and Senator Cornyn were talking about. Ted Cruz: Um. Is it correct that the Constitution vests the authority in the President? Ted Cruz: And if an attorney general disagrees with the policy decision of the President — a policy decision that is lawful, does the attorney general have the authority to direct the Department of Justice to defy the President’s order? Sally Yates: I don’t know whether the attorney general has the authority to do that or not but I don’t think it would be a good idea, and that’s not what I did in this case. Ted Cruz: Well, are you familiar with 8 U.S. Code § 1182? Sally Yates: Not off the top of my head, no. Ted Cruz: Well, It, it is the binding statutory authority for the president’s executive order your refused to implement that led to your termination, so it certainly is a relevant and not obscure statute. Cruz goes on to quote one part of the statute. Ted Cruz: By the expressed text of the statue it says, quote: ‘Whenever the President finds that the entry of any alien or class of aliens into the United States, would be detrimental to the interest of the United States, he may by proclamation, and for any period he shall deem necessary, suspend the entry of all aliens or class of aliens as immigrants or non immigrants, or impose on the entry of aliens, any restrictions he may deem appropriate.” Would you agree that, that is broad statutory authorization? Without hesitation, Yates replies with the additional provision that “trumps” (yes, she uses that word) Cruz’s statute section — basically out-lawyering him and putting him in his place for all the world to see. Sally Yates: I would, and I am familiar with that and I’m also familiar with an additional provision of the INA that says: “No person shall receive preference or be discriminated against in issuance of a visa because of race, nationality, or place of birth.” That, I believe was promulgated after the statute that you just quoted. And, that’s been part of the discussion with the courts in respect to the INA, is whether this more specific statute trumps the first one that you just described. But my concern was not an INA concern, here; it rather, was a constitutional concern. It seems Ted Cruz is still desperately trying to ‘find himself’ after the election — but then, it’s really dark up in Trump’s world. How refreshing to witness the kind of nonpartisan integrity we saw today from two former government officials who sadly both lost their jobs, directly/indirectly, because of it. But many feel we’ll be hearing more from them again and think today we witnessed what two possible presidential candidates look like. Cheers to Sally Yates and James Clapper for making America proud. This entry was posted in Congress, Executive Order, GOP, Politics, Sally Yates, Travel Ban, Trump. Bookmark the permalink.